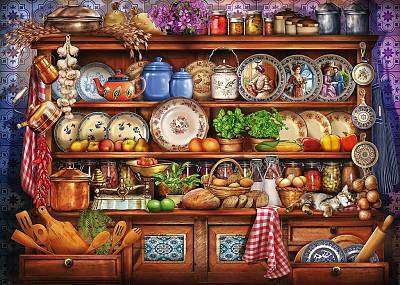 Ravensburger Jigsaw Puzzle - MUM'S KITCHEN DRESSER 1000 Piece Family Kids Jigsaw. This vintage Welsh dresser combines the pretty and the practical - a perfect match! The finished puzzle measures 70 cm x 50 cm approx when complete.